Marketing is undergoing a transformation. The so-called “22 immutable laws of marketing” have mutated. They’ve been broken. Now they are being repealed. Bold moves by companies such as Samsung, Apple, Google, Hyundai, Adidas, JetBlue and McDonald’s — to name some of the most visible ones — are re-writing the marketing playbook. The innovation is coming from the corporate side and from bold thinkers . To name just a few — Douglas Holt, Marc Gobé, Gerald Zaltman, Larry Light, Joan Kiddon, Joseph Plummer, Jae Hang Park. There are many others. We can all learn from the example of Philip Kotler, the father of modern marketing, who is continually seeking a better framework for marketing as the world evolves (Marketing 3.0 is his newest explanation of this third wave in reinventing marketing). The future of marketing is built on a better understanding of how the human mind works. The future of marketing is based on new learning into the sheer power of metaphors and story telling to shape the very way we understand the world. It is based on the breakthroughs being made by neurologists who are able to study our brains in ways unimaginable 15 years ago. fMRI and other technology are opening new windows into our brain, giving us a better view of what happens inside. This is not a tale from a Avatar or some other 3-D science fiction film. It is well-known from the work of Steven Pinker, Oliver Sacks and others. The future of marketing is based on the simple principle of co-creation. That means the consumer is central to the process. It recognizes the essential role consumers have in co-creating meaning and value. The future of marketing embraces technology as a strategy, not just an execution. The new new thing –QR codes, social media, hyperlocal marketing — the technologies of the moment will continuously change. Marketing will break down the internal silos that agencies & corporations erect around the digital world of online and mobile to separate them from the analog world of TV and Radio. The future of marketing looks at the ways a story jumps from one medium to another, the way a book becomes a movie becomes a Broadway musical becomes a video game becomes a theme park attraction becomes an app, becomes an iPad iBook, becomes…. The past of marketing is static (position), focused on the competitor (different) and not the consumer, reductive, minimalist, simplistic to the point of trying to summarize everything into a single word. 1/1/11 is the start of the Decade of Narrative Marketing. The future is an open book. Go ahead, write the next chapter. Here are some more observations based on the BrandAsset Valuator work of Ed Lebar and Anne Rivers that was presented to the NYAMA last March. I bring this up again because much of the economy is still stuck in recession. One is that there are winners and losers in any economic downturn. Even one as steep as what we’ve just experienced. By the time the economy turns up again, the winners will have moved clearly ahead of the losers. At that point it may be too late to catch up. Certainly it is more expensive to play catch up than it is to invest in marketing during the downturns. 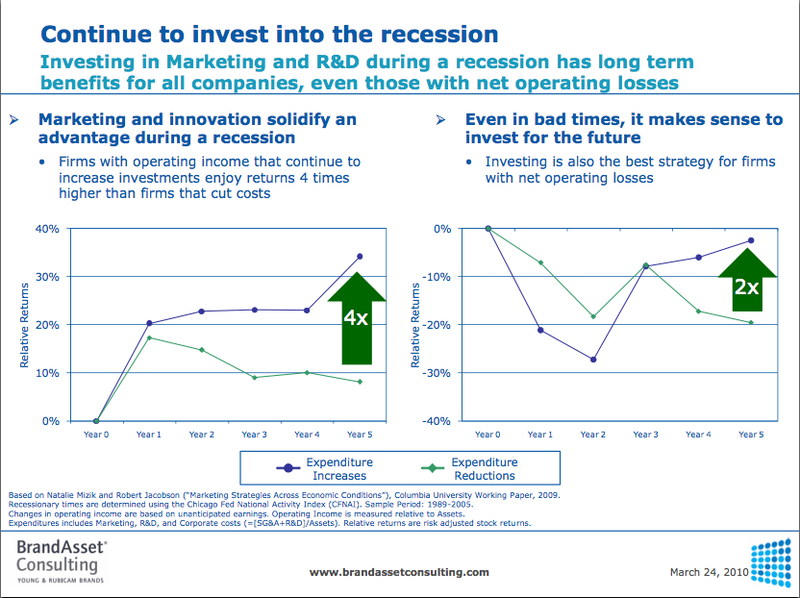 So here we have the BAV data demonstrating that companies who continue to spend on marketing and R&D are generally better off over time than those who make severe cut-backs. Marketing and innovation are the engines of growth. Turning those engines off puts the future growth of the company at risk. Having said that, the short term pressures and temptations to make the cuts are often insurmountable, particularly when faced with a panic like 2008-2009. Even companies healthy businesses cut back on their marketing. Hard data like the BAV is not convincing enough when it seems like the floor has opened in the economy. Of course the most powerful levers that an individual company has to reverse the drop in demand are marketing and product innovations. No single company can make up for the lack of demand across the economy. But they certainly can influence the demand for their own products. Simply look at Subaru, McDonald’s and Apple for examples. 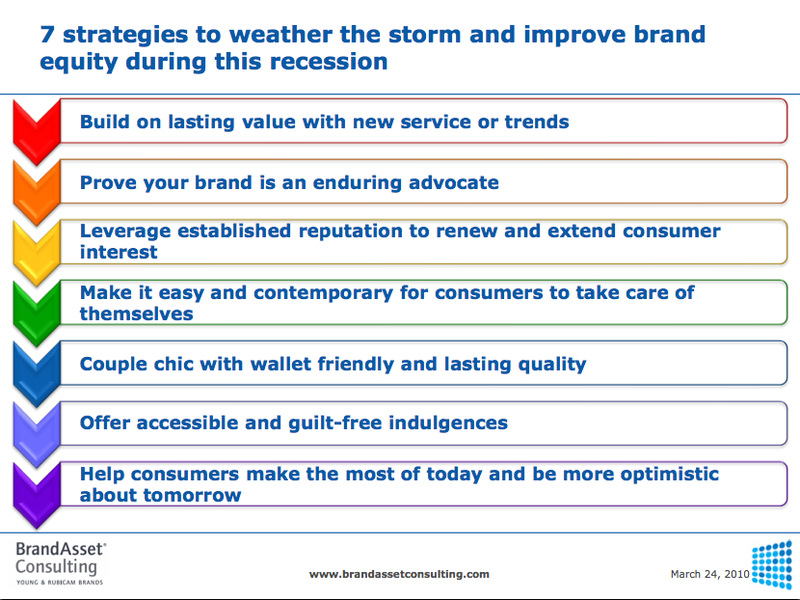 And here are seven different strategies that were identified as contributing to the success of brands during the downturn. These were derived empirically. Having said that, they make complete intuitive sense. Ed and Anne use Jeep as an example of a brand being an enduring advocate. I would add Hyundai to that list, too. With their buyer assurance they hit on several different points all at once. The BAV also appears to support the observation that this particular economic crisis is going to have lasting effects on the people who are living through it. When the recovery really does come around, the old habits won’t just bounce back. Too many fundamental beliefs have been shaken this time around. 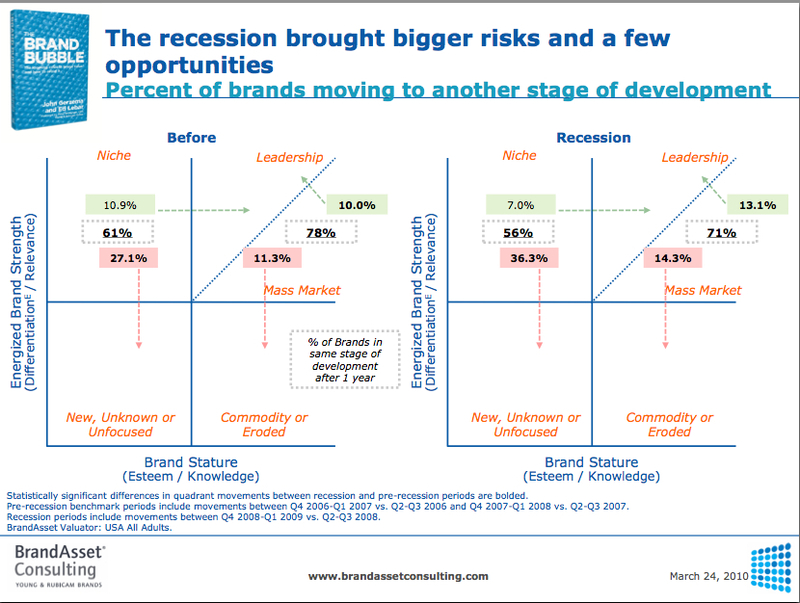 The top brands are more likely to lose their top position in this economy than in “normal” times. The economic disruption is creating an upheaval that threatens to overturn many brands. This is the story told in BAV research conducted by the good folks at BrandAsset Consulting — Ed Lebar and Anne Rivers — and presented to the NYAMA last spring. Before the recession 78% of brands in a leadership position were still in that position one year later. Not a whole lot of movement there. Now, that has dropped down to 71%. The chances of a Niche brand to move into a mass market leadership position has just gotten worse. And niche brands are even more likely to slip than before. These changes have come about for a combination of reasons. Some reasons are external, outside the control of any one company. For instance, the downturn has changed people’s values and purchasing patterns. Other reasons are internally driven. For instance a company may have cut too far back in their marketing as a response to the downturn. Or they may have seen this as an opportunity to increase their marketing and launch new innovations. A picture-perfect example is Hyundai in 2009. At the very start of the year, during the Superbowl, they introduced their buyers’ assurance program. While the overall car category tanked, Hyundai ended with strong increases in sales and market share. From this we can draw two conclusions: 1. The economic turmoil creates a situation where consumers are more receptive to trying something different. 2. Companies seeking to move up have a greater opportunity during times of economic turmoil. So why don’t more companies reach for those opportunities during bad times? Sometimes they can’t due to a lack of resources. Sometimes they can’t due to risk aversion. Sometimes they can’t due to internal pressures where any increase in marketing spend is seen as taking away dollars from some other part of the organization. It is also a case where the brand managers of a leading brand have a difficult business case to make. “We can reduce the risk of losing market leadership by investing more, now” doesn’t grip you by the shirt collar and scream. Look at the logic — do nothing extraordinary and you still have a 71% chance of being the leader next year. But if you spend more during the downturn, people look at you and say — “What, are you crazy? You were the leader before and you are still the leader now. What was the benefit of that extra spending?” Avoiding the downside isn’t always so intuitive. Last night was the annual Effies award dinner, so I dug out my tux and put on a bowtie. On my way over to Cipriani I was wondering why I don’t wear these to client meetings. It’s fun to dress up. The place was packed, the event sold out. More than 750 people attended and many others were unable to buy tickets in the first place. I also saw the Effies from a completely new perspective. In the past I had been one of the ad agency people sitting at a table wondering if we won bronze, silver or gold. The tension was gone this year since I was attending in my role as a board member of the NYAMA. That made the whole evening more enjoyable. One friend asked me, “So what does ‘effie’ stand for? So here’s the list of winners, in case you missed it last night. In case you missed this morning’s edition of Ad Age, Hyundai has been voted “Marketer of the Year” So Kudos to the folks at Hyundai and their various agencies! In a year when other marketers were soft-pedalling the economic crisis, Hyundai addressed it head-on with frank and honest messages. That’s pretty refreshing. And they paid off the marketing with cars that are remarkable for their quality and design. I rented one in the middle of September and was very surprised and pleased. It is proof that you can change people’s minds about brands with a strong narrative. This should bring optimism to any marketer with a brand that has drifted. It takes time, it takes bold moves, but it can be done. It is easier to change people’s minds than it is to change your brand. The company has come a long way from the days that it was first introduced to America in advertising by Backer and Spielvogel. Now maybe someone can step in and give Chrysler some help? Are you a fickle consumer or a smart shopper? Nearly four in five Americans were repeat buyers back then, staunchly faithful to brands that they knew, trusted and were part of their self-image. The allegiance often continued through generations of families, like party affiliations in politics. Are we fickle because we moved away from one brand and toward another? It seems to me that there has been a shift in mindset among car buyers but that doesn’t mean from stable to fickle. Also, some of the brands that people are moving away from are soon disappearing from the marketplace. Hard to remain loyal to a brand like Pontiac that is being decommissioned. The growth of Hyundai and Kia are noted in the article but what isn’t noted is the really really smart marketing that Hyundai has done with their buyers assurance plan. Switching to a different brand that better meets your needs is not fickle. People change their minds all the time without being fickle. “Fickle consumers” makes us sound like the a teenager with a crush on a different person every week. To their credit, the Times does go on to acknowledge the role internet has played by opening up a whole new way of thinking about car buying. Perhaps I am being unfair. One sentence should not drag down what is an otherwise interesting story. Ad Age has also nominated Lego as one of the top 5 marketers of the year. We, dear readers, are in the cat-bird seat to select the winner. In my last post I waxed eloquent about Hyundai (my choice for winner) and McDonald’s. This post I want to wax eloquent about Legos. They have been phenomenal in the past couple of years. Today I was walking through the fabled F.A.O. Schwartz toy story here in NYC. I was picking up my daughter from a birthday party that was being held in a special party room of the store. We took a few minutes to just wander around the store and talk. At one point my daughter pointed and said, “How cool is that! It’s the Harry Potter characters in Lego.” Indeed, there was an enormous Rubeus Hagrid along with Harry and several other characters. So, Legos, you got a big thumbs up from a 12 year-old girl who remembers playing with your toys when she was younger and now sees a whole new reason to play with them…without feeling childish. How cool is that! Just remember, vote early and vote often!